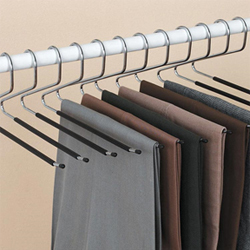 Never worry about a pair of creased trousers again with these hangers for trousers! We’ve all felt the pressure – rushing to get ready when you find your favourite trousers have fallen off their hanger and are lost in the abyss that is the bottom of your wardrobe. When you do finally lay hands on them, they’re creased… cue the iron! Wouldn’t it be that little bit easier if you could just whip a pair of trousers off the hanger knowing that they are pristine and not a single crease in sight? Well now you can! These handy hangers will hold your trousers and keep them pristine as the moment you ironed them. You get enough hangers to hold up to 12 pairs – no more doubling up on your hangers! Who said getting ready for work is difficult? What’s more, you can rid that pile of miscellaneous clothes that have fallen to the depths of your wardrobe. Your clothes will be kept neat, organised and you need never have to search for your Sunday best again! These hangers are made from chrome plated metal with a sure-grip coat to keep them in place; there’ll be no such thing as a pair of crinkle cut trousers in your house! So go on, what’ve you got to lose? Creases? !